January 29, 2018, Abu Dhabi – Rosatom participated in the World Future Energy Summit (WFES) that took place in Abu Dhabi, UAE, on January 15-18. The WFES is the foremost global annual event dedicated to advancing renewable energy and clean technologies. The Summit is traditionally held as part of Abu Dhabi Sustainability Week, under the patronage of His Highness Sheikh Mohamed bin Zayed Al Nahyan, Crown Prince of Abu Dhabi and Deputy Supreme Commander of the UAE Armed Forces. Rosatom presented an exposition inspired by the so-called ‘green square’ concept that forms the basis of energy’s sustainable development. The concept envisages four key types of future clean power generation – nuclear, hydro, solar and wind power. The exposition presented Rosatom’s cutting-edge technologies and projects in nuclear power, hydro power and wind power. Rosatom also presented innovative solutions that have applications beyond the nuclear industry. 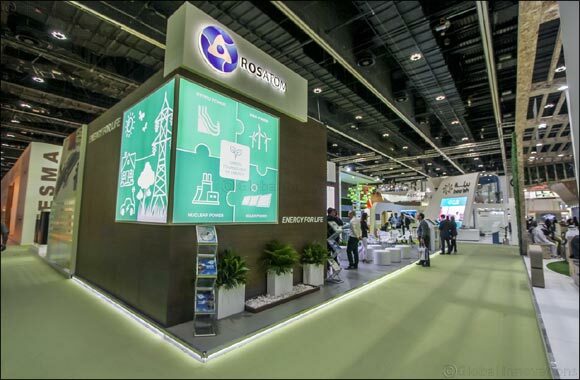 Daily presentations were held at Rosatom’s booth for the unique Multi-D system for the lifecycle management of capital construction projects. This web-based platform was developed by ASE Group (a subsidiary of Rosatom). It allows to create a totally customized 3D information model of all project activities including financing and procurement, accounting for any potential risk factors to the project implementation and identify effective ways of mitigating those risks. Multi-D has been successfully deployed in practice, helped to complete the construction of Unit 3 at Rostov NPP, Russia, two months ahead of schedule and with budget savings. Today, Multi-D is successfully used in other industries beyond the nuclear field. Rosatom relies not only on nuclear power generation today. Apart from implementing modern projects in the field of nuclear power, the Russian state corporation is engaged in development of other 'green' areas of non-nuclear generation. For instance, in 2016, Rosatom won the bid for the construction of three wind farms in southern regions of Russia. The volume of investments in this project will exceed EUR 1 billion. Rosatom’s wind power business’s project portfolio totals up to 1 GWe in capacity. Another 'green' energy business of Rosatom that was presented during the Summit are projects in the field of small hydropower.